Here’s a preview of the new 0-10 attribute points system. For 2020, you can see a few tweaks from these values. I have tweaked his Leadership and Stamina up to 8s, which still correspond to 4s in the old system but are the upper value. His Experience has been increased from a 2 in the old system to what would be a 3 in the old system (6 in the new, which is the upper range of 4, 5, or 6), and his Issue Familiarity was a 3 in the old, and is a 6 in the new (which is the upper value for an old system 3). One result of note is that going from 1-5 to 0-10 means there are half-points for Command Points, bonuses, and so on. As a general rule, bonuses followed a -2, -1, 0, +1, +2 scheme, corresponding to attribute values of 1 to 5. Because there are an extra 6 possible values, however, this is now -2.5, -2, -1.5, -1, -0.5, 0, +0.5, +1, +1.5, +2, +2.5. So, you get more refined bonuses, and a slightly larger range of possible bonuses. A similar result obtains for, say, running ads. His bonus for running ads based on Leadership is 1.5 for an 8 instead of 1 for a 4 Leadership value in the old system. Congress Infinity v. 2.8.6 released! I really like this new system; although, I disagree with some of Trump’s numbers. How do you determine leadership for a candidate? I’d argue his leadership skill is one of his weakest traits. I’d have leadership at 3 or 4. Integrity at 2. The rest seem accurate enough. For Trump’s Leadership, I first look at past leadership success. So, he grew a company into a very large corporate entity, which requires leadership. I then look at his 2016 campaign. Consider his general election campaign, where he won while spending much less money and having a much leaner campaign organization. And, of course, his actions since becoming President, including many successes from his perspective (2 S.C. Justices, tax cuts, significant successes against ISIS, a very strong economy, movement towards peace with N. Korea and S. Korea, NAFTA renegotiated to USMCA seemingly in U.S.’s favor, and so on). Trump is polarizing, but many great leaders are. Those who react strongly against him might think he’s a poor leader, but I don’t think that’s accurate. Also look at how he has reshaped the Republican party. His views on free trade, immigration, and repudiation of Bush era foreign interventionism, for prominent examples, have significantly changed the party. I’d argue that the only “Successes” due to his leadership are the peace with N. Korea and renegotiating NAFTA that’s about it. I expect the Republican party to reverse course, especially if he ends up being a one-term president. I don’t think his past success can be attributed to leadership. He failed in the majority of what he accomplished and succeeded mainly due to family wealth and having the wealth to allow him to fail. It’s too soon to credit Trump with the economy. He hasn’t screwed it up yet, however. The economy is either entirely or partially Obama’s work. I’ve read numerous time that you can’t fault or applaud a president for economic success or disaster in their first 2 years, since the effects of the administration can take some time. If the economy is still strong Jan 20ish, then I’ll give Trump partial credit. If it soars by then, then I’m willing to give him more. I guess that’s why there’s an editor. I don’t think anyone is going to reach any agreement on Trump. I know for my version of the game, the leadership will be decreased for reasons that I think are valid. I’ll reduce his integrity to 2. I’ll keep everything else as you have it. You did convince me on the Charisma a few weeks ago. What you said about his leadership sort of just reinforces my own position on it. I also don’t think he has some real leadership skills, in general (ability to share credit or give credit, accept blame, compromise, and for presidential leadership, any sense of moral authority or bringing togetherness). I think Trump’s leadership is one of his best skills. I’d have it at a 9. Hmph. MAGA fanboy much, Anthony? An essential part of leadership is team work. The trait in this game seems more like “implementation of self-interest” by Anthony’s definition above. What he details is a skill other than leadership, in my opinion. Leadership should be more about the party and cohesion of that party. Charisma takes the place of leadership over followers. Maybe leadership needs to be renamed. Leadership, as intended for the game, is a complex trait and can take multiple forms. Different people have different leadership styles. The question for the attribute value is whether they get results. Trump has outlined a vision, convinced many people to follow him, and led fairly boldly. Of course many people don’t like his vision, or his style, but it’s still leadership that has gotten significant results! I’m trying to get as objective as possible of values, and I’m happy to get constructive feedback about these ratings, but using strong reasons and argument. Sure, that might happen. But those are *if’s*, not things that have actually happened. If they happen, then that’s a consideration against his Leadership. Can you be more specific here? It’s clear that Trump’s wealth far exceeded his father’s. Yes, he had an advantage having a father who was successful in construction, both in knowledge and financial resources, but he had significant success in 1. Building a business and 2. becoming a celebrity. How are you quantifying ‘failing in the majority of what he did’? Yes, as more information comes in, my assessment of Trump will be revised. It is hard for me to believe that Obama deserves *all* the credit for an economy 2 years out. As you said, at a minimum Trump deserves credit for not messing it up (which many people predicted – do you remember the doom and gloom predictions if Trump were to win?). However, there are various obvious causal factors which can be pointed to – tax cuts, deregulations, trade deals, and a generally pro-business government attitude which in turn can instill confidence in businesses to invest. In studying Trump, it is clear he gives credit quite often. As an example from just a few hours ago, Trump gave credit to Kevin Brady as the ‘King of Cutting Taxes’. I have seen this repeated in interviews, televised cabinet meetings, and so on. Yes, he has a narcissistic tendency, but he gets leadership enough to know to give credit and praise other people. Trump’s seeming lack of compromise is usually a negotiating tactic. He will start with an ‘initial offer’ that is extreme, and then moderate. For example, look at the outcome of the recent trade deal with Canada – in the U.S.’s favor, yes, but much more moderate than an all-or-nothing cut-Canada-out and put 25% tariffs on their auto industry position. I think you’re right that his divisiveness re the entire country leads to a lack of moral authority among a significant part of the country – and that’s a weakness of his. But leadership applies to more than that (to his campaign, his party, the ‘MAGA movement’, manufacturing workers, and so on) – and he has demonstrated strength in those areas. Thanks for the feedback! 2020 will be the focus after the mid-terms. Leadership is tough. I think of Trump less as a “strong leader” and more as an Authoritarian, if that makes sense. Many inside sources from both his campaign and the White House have painted both as organization nightmares. His leadership style seems to be berating people and simply demanding they do their jobs better without any sort of real feedback or directive, which quite frankly is a terrible leadership style. Most reports are that he won the Presidency despite the inner workings of his campaign, not because of it. His brash messaging ignited a large movement that had already been bubbling beneath the surface, he didn’t actually need to do much himself. But as I said, he’s also a total Authoritarian who uses his status as President to make bold, sweeping statements of intent and policy that the rest of the country is then forced to follow. He makes people play his game. If there was a “Strategy” trait, I’d set that really high and set Leadership low. Maybe having high Leadership and low Campaigning stats would help keep things accurate? Yes, this is an important point. My problem with many of these inside sources (usually anonymous) is that I heard exactly that again and again during the campaign, and yet the campaign kept doing better and better. I kept thinking ‘If these reports are anywhere near accurate, the campaign is bound to fall apart soon’, and yet it never happened. What to make of it? Is Trump just extremely lucky, managing to ride a good idea (brash populism) to the Republican nomination and then the Presidency? Or was the disorganization not actually as portrayed by those inside sources? My best conclusion is that the campaign was running fairly well, and again with the presidency (see the accomplishments). One thing that can be said with certainty is that there has been significant turnover in certain parts of the administration. Does this mean Trump isn’t leading well? Trump became famous in significant part for firing people, so that he’s fired people at a higher rate in certain parts of his cabinet or upper levels of government isn’t altogether surprising. Hiring and firing people is a crucial part of leading an organization, and again, there are different leadership styles for this. Some fire early and often, some like to wait and give the person more time. I’m not sure this really says much in itself, especially given where Trump was coming from (remember how early in the administration it was getting hammered by leaks? consider the steep learning curve which running the federal government entails, especially for someone who has no experience running a government). One question, will the other attributes like ad strength, spin, commande corruption, etc be a 0-10 or will they remain 0-5? I for one, like the change to the 0-10 because it give more finer differences between candidates. I’m surprised you haven’t heard of how many times he’s gone bankrupt or had businesses flops—-United States Football League, Trump University, Trump, Trump Airlines, Trump Network, Trump News Media, etc etc etc. He routinely fails. I think the Apprentice has really been his most successful project—far more than his real estate projects (many which failed) and presidency. Yes, Campaign Attributes have also moved to 0-10. Re Trump’s business failures, do you think Richard Branson is a good business leader? He has had many business failures. Remember Virgin Cola? Virgin Digital? Virgin Cars? These sorts of things have to be put into context. Trump’s business successes far exceed them (as Branson’s exceed his failures), such that Trump’s net worth when he began his presidential run was north of $2B (probably above $3B). It was this very large personal wealth that gave him certain key advantages over his competitors (no need to spend time fundraising, no need to take issue positions to appease key donors, and so on). It sounds right to me that Trump has a more authoritative style of leadership compared to many people, but that’s a style of leadership, not lack of leadership. It has its strengths and weaknesses, as other styles do. First of all, I want to say that I love the creation of a 1-10 scale rather than 1-5. That being said, I believe the Trump ratings could use some suggestions. Does anybody think he knows things about the issues? 538 has a nice page comparing their best estimates of Trump’s approval ratings compared to other presidents (like all polling, these results have to be taken with a grain of salt). and then scroll down a bit. It’s about the same as Obama’s, Clinton’s, and Reagan’s at similar points in their presidencies. What I find most interesting about the Obama-Trump ratings is the clear downward trend of Obama’s from 68% to 45% at 650 days. Trump’s, on the other hand, has been much more constant, going from 45.5% to 42.3%. So, was Reagan’s low approval rating at that point a sign of a dearth of leadership on his part? I don’t think there’s a clear line from approval ratings to leadership. When can we expect this and favorability? If we have to pay for a subscription now we should receive updates a little more often even if it is just saying an expected date. 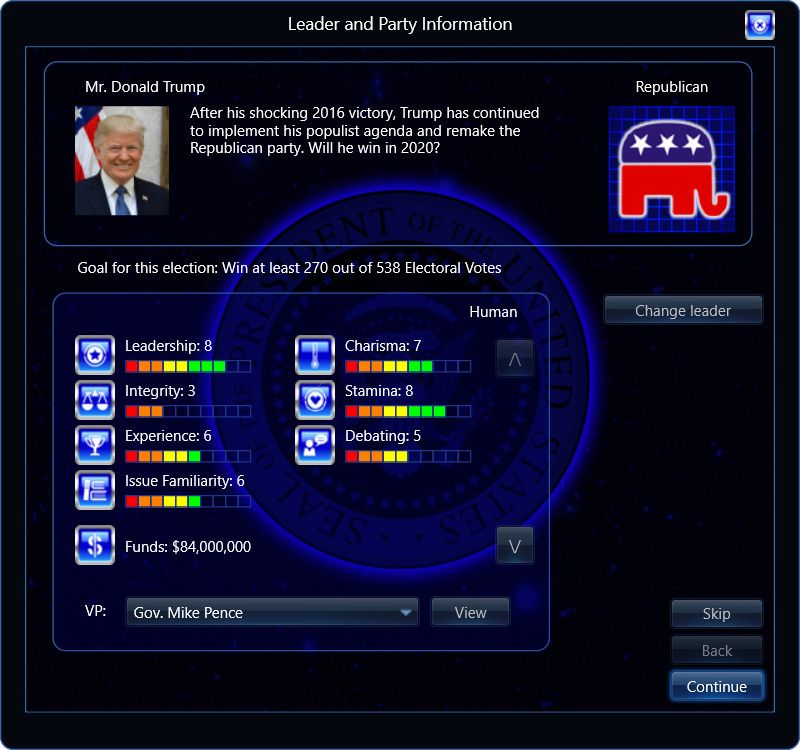 For President Infinity, there will probably be a release first with this (and everything else from the last sneak-peek), and then one with Favorability, in order to get feedback on the new attribute system quicker. Thanks everyone for the feedback on Trump’s Leadership attribute – it has helped clarify some of the issues regarding it for me. The 8 stays for now, but I will be looking at things as they unfold over the next 2 years and it may be revised. I’ve added a link to the goals for next releases page from the updates page (just click the Updates button in the game, or here https://270soft.com/updates-redownloads/ ), so it’s easier to find out what the latest goals are. Thanks for this! A low approval rating isn’t a sign of low leadership in itself but consistently low approval rating is. The country has never been approving of him. What president that wins an election and can’t exceed 50% approval has a leadership of 8?